Following Mary Lowndes call out, ‘Let us go then and make banners and let them be beautiful’, we will look back on the lives and struggles of women in the past and reflect upon our struggles today. Inspired by the beautiful green, white and violet banners of the suffragette movement, we will make our own to express our current hopes and concerns. A unique opportunity to be part of a historical celebration and remind us all that the fight for equality is not over yet. 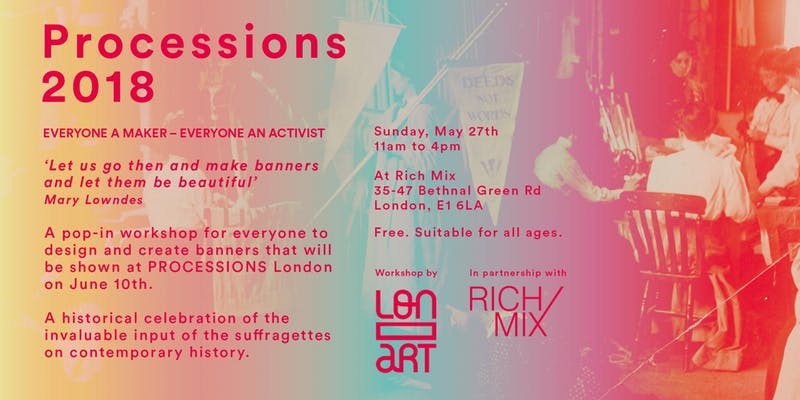 A pop-in workshop for everyone to design and create banners that will be shown at PROCESSIONS London on June 10th. A historical celebration of the invaluable input of the suffragettes on contemporary history. Inspired by the banners the suffragettes made a century ago, we will sew our messages on gender equality onto textiles and make our own banners. We will use their colours and shapes, but we will adapt the message to the needs of contemporary women. The suffragettes are inspirational activist heroines, the sheroes of their time, that are to be celebrated, but we also have the duty to give continuity to their work. This workshop will help us remember how far society is from being equal and how present we should have the suffragettes’ spirit today to keep fighting towards a fairer society. Together, we will design, sew and paint some fabulous banners. All ages (incl. families and children) and ideas welcome.